One of the very few shows on a Monday night in Sydney and the only Kings Cross Karaoke show. Karaoke Samurai has been providing the karaoke here for four years. Despite being on a Monday night this is one of the most popular karaoke shows for Sydney on any night of the week. Backpackers and tourists make up the majority of the crowd, however there are also a fair number of karaoke Die Hards also in regular attendance. A peculiar feature of this show is that there are frequently large groups of singer on stage singing at once. The guests at the many Backpacker Hostels usually get up as a group. Karaoke Samurai provides a TV screen, a Foldback speaker, the karaoke system and the host. We patch into the Hotels sound system and a large wall mounted TV. The venue also provides a stage for performances and where we set up and Host the karaoke. The with a enthusiastic regular crowd and it’s popularity with tourist this is easily the most popular Kings Cross karaoke night. The Monday night show at O’Malleys is the great survivor among karaoke in this area. It continues to be just as popular despite the downturn in Kings Cross since the introduction of the 1.30am Lock Outs. Other karaoke operators have been unsuccessful in establishing lasting karaoke nights. This is in part because they don’t have the online promotion resources of Karaoke Samurai. This online presence has consistently attracted people to the the show regardless of seasonal variations in tourist numbers. 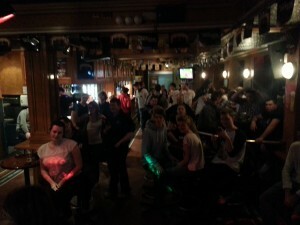 O’Malley’s Hotel has karaoke every Monday night from 9pm and 1am. Read review.